One of the best-known squares of London, Trafalgar Square acts as a thoroughfare through much of central London. As the gateway between the main shopping district of the city centre and the West of the city, Trafalgar Square is famous for being the home of the National Gallery and the National Portrait Gallery, alongside the iconic Nelson’s Column. Although guests at the Park Grand London Hyde Park will likely be aware of the main attractions in Trafalgar Square, you won’t be surprised to learn that the sheer amount of history in London has meant that many facts about Trafalgar Square lay forgotten. Below are some insights into the hidden gems of the square, giving you some extra information with which to impress or, depending on their perception of you, surprise your friends or family. Built in 1926, the smallest police box in London was introduced to Trafalgar Square. The reason for this was for police officers to keep a low profile, especially when watching over large protests and gatherings in the square. The Police Box can be found on the South East corner of the square and has a round black lamp above it. In the present, a time when police feel no need to remain so inconspicuous, the police box is no longer needed, and so it is used as a cleaner’s store room. Nelson’s Column stands proud within the centre of Trafalgar Square, proud to be British and commemorating some of the British Empires prouder moments. The column itself is so British in fact, that its granite-built spine is completely British itself. The granite was mined from Devon and is the sturdy base for the statue of Lord Nelson. The four bronze lions at the base of Nelson’s Column are a fierce reminder of Horatio’s heroism. The original lions were made of stone and were not deemed impressive enough as homage to Nelson. These lions were built by Thomas Milne, and on being rejected were sold to Yorkshire Industrialist Titus Salt, who brought them to his village of Saltaire. The fountains in Trafalgar Square were introduced later than the square itself. Not part of the original square design, the fountains were introduced by Charles Barry in 1845 to discourage large gatherings and protests. The two original fountains made it harder for crowds to form and were replaced in the early 20th century. The original fountains were given to the Canadian Government, now being found in Ottawa and Regin. The British Imperial measurements of inches, feet and yards may have lost its popularity back with the decline of the British Empire, but you can still find a reference point in Trafalgar Square. If you want to compare how many feet your foot measures, or how many centimetres in an inch (who doesn’t?! ), then this historic reference point in the square is for you. 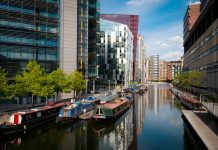 For those guests at the Park Grand London Kensington, you’ll probably be used to putting London into Google Maps or searching the distance online. Wherever you’re coming from, it’s easy to find your distance to the UK capital online. What many people don’t know though, is that the exact location of the city of London is marked as Charing Cross Station. Based on the corner Trafalgar Square, Charing Cross is technically the centre of London for computers. 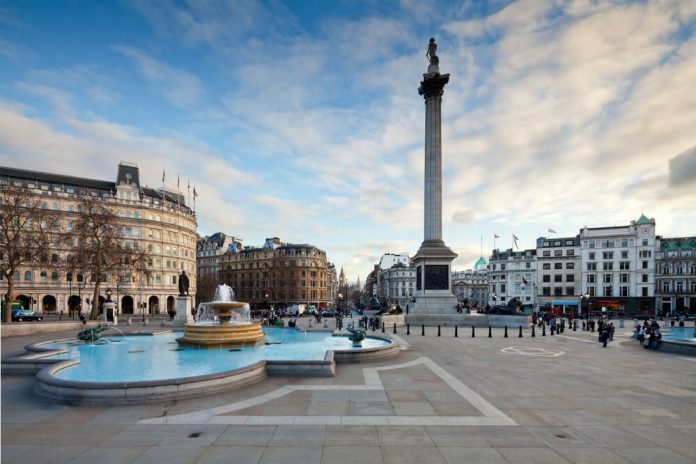 Share the post "Interesting Facts You Didn’t Know About Trafalgar Square"